The book, “A Long Walk to Water” written by Linda Sue Park, tells two separate stories which are brought together in the final chapter. The first story centers around Nya, an 11-year-old girl living in Southern Sudan who must make two long walks to fetch water for her family each day. The second story is based on the true life experiences of Salva Dut, who is forced to flee the war in Southern Sudan when he is 11 years old and becomes one of the Lost Boys. As the story unfolds, Salva’s journey eventually intersects with Nya’s in a surprising way. 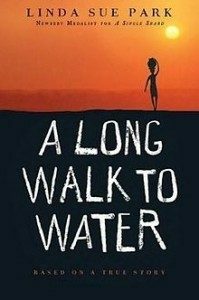 “A Long Walk to Water” is a powerful read for older children and young adults.